I've always been indifferent about the character of Lady Christina De Souza, the one-off guest star from Planet of the Dead (the 2009 Easter Special) starring David Tennant. I was never fond of that story, which to me always came off as a run of the mill average episode being touted as a big special in a year with a lot less Who. I am often more forgiving of average Who stories when they are in the middle of a full year...but if you only get a few in a year, they all have to up their game. The character of Lady Christina was definitely tied to this. Michelle Ryan is charming, but the character always felt like someone overwritten to be the coolest person in town. Flawless and fun and witty and can do all sorts of cool things. She is the thief with a heart of gold...but it always felt very forced. I failed to connect with the character. But that didn't matter in the long run. It was just one episode. But with Big Finish no having the rights to almost all things New Series, every one off character and their mother can get their own series! 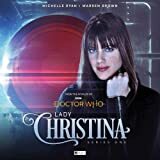 So Lady Christina gets her very on Audio Spin-off series. It isn't a bad series, in fact, it has plenty of moments of fun, but it didn't really move the needle on this character for me. The character only got one shot on TV, so if you are going to build a series around her, you need to flesh out her character. Beyond the all too fleeting moments with her father in one episode, this set definitely failed to do that. So she ends up being written as a bargain bin version of River Song, a sassy witty adventurer with a bad girl side. That's the biggest flaw for me. I didn't hear anything in this character that didn't end up sounding like it could've been just as well coming from River. The difference being River had a ton of on screen adventures that fleshed out her character, and the boxsets I've so far heard from her also added onto her character. This is just some light adventures featuring a character that lacks much depth. Again, Michelle Ryan is charming and she is playing the part with some gusto...but the lack of any real character development hurts this set immensely for me. The opening story is actually fun and showed promise. It weaved a fun tale of adventure, robbery, and a hint of alien tech, and made me think that maybe this series could work, despite my utter indifference to the lead character. A bit of light Doctor Who alien stuff mixed in with some crimes? Sure! But then the second story felt like it was a riff on the plot of Partners in Crime...right down to the involvement of Sylvia Noble (which ends up being a practically random guest star). Other than the involvement of Christina's father, which is too underwritten, the story left me somewhat cold. I would've enjoyed it as a Tenth Doctor tale, but I was feeling that this series had the potential to do something new...a thief as the lead. It should be a show about a thief stealing alien artifacts...and that should be the focus of the stories! Though the third episode returns to that premise, I have to say it was sadly a bit of a mess. There were good ideas floating around, but it was too unfocused. The finale of the set also felt unfocused, though not nearly as muddled as the third episode. The set just limps to a conclusion, and it didn't leave me frothing at the mouth for more adventures with Lady Christina. Ultimately, the set didn't grab me. It is mostly serviceable light fun, but nothing I will remember a week from now. I went into this with a total neutral feelings on the character and the whole idea of her getting her own series. Sadly, the set has me walking away feeling exactly the same. I am no offended by it's existence, now do I care if it continues or dies right here. There were nuggets of fun, and certainly, some will find it a good time. Give me River Song any day.